Publish a new version of the bot. Amazon Lex takes a snapshot copy of the $LATEST version to publish a new version. Create an alias that points to the new version. For more information about versioning and aliases, see Versioning and Aliases. In the Amazon Lex console, choose one of the bots you created. Verify that the console shows the $LATEST as the bot version next to the bot name. On the Publish botname wizard, specify the alias BETA, and then choose Publish. Verify that the Amazon Lex console shows the new version next to the bot name. 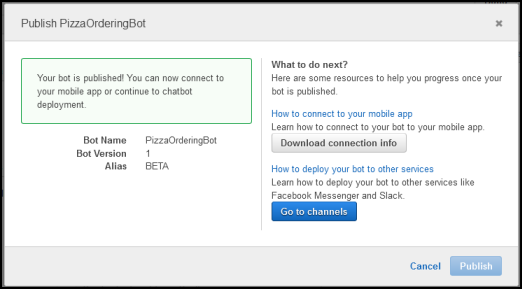 Now that you have a working bot with published version and an alias, you can deploy the bot (in your mobile application or integrate the bot with Facebook Messenger). For an example, see Integrating an Amazon Lex Bot with Facebook Messenger.